Hi Guys. Today’s topic is a great one and one I’ve worked really hard to achieve, it’s a work in progress for me but worth the effort. Self-Assessment Question #7 : Are You Blocking With Your Seat? Collapsing at the belly button in an effort to absorb the motion. Pumping with your upper body at the canter. Leaning back and driving with your seat. Tense hips will cause bouncing, head bobbing, flying elbows and lower leg flapping. However, do not despair, there’s plenty that can be done about it. You will need to work on thinking tall and elegant and transferring any rocking/blocking to the pelvis instead of the upper body. Experiment by following with your seat in the walk. Really exaggerate the movement. You may find your horse becomes irregular in the walk as you push him out of his rhythm. Follow this with a complete stop in the motion of your hips. Lock your hips. Notice the effect it has on your horse. Find the natural balance between pushing with the seat and blocking with the seat. This is where your following seat is correct. Now think about opening THE ANGLE of your hip, but first, do you know where your hips are? 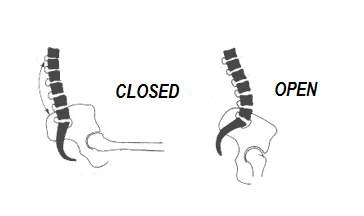 The hip joint is the joint between the femur (thigh bone) and the pelvis. Its primary function is to support the weight of the body. The joints of the hip are the most important part of your body in your quest to retain balance. We all know that word don’t we? 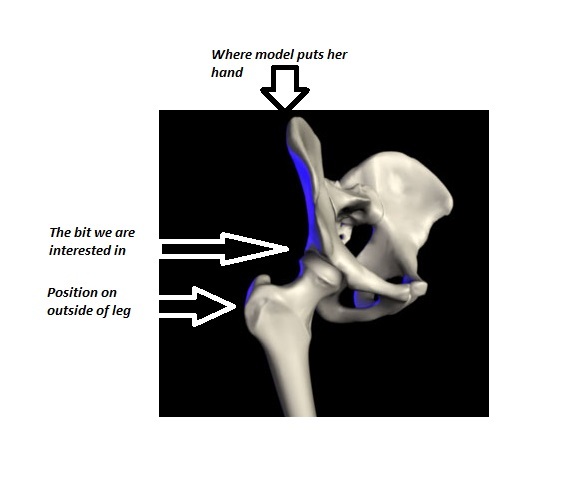 Most riders would think of the point of the hip (where the model puts her hand) whereas others might think of the position at the outside of the leg. As dressage riders our interest lies in how the hip functions and so we need to delve deep and feel for the movement of the joint. The ball and socket bit. The best way to do this is from a sitting position (can be in the saddle) and by using your index finger to follow the crease of your underwear move your knee left and right. Feel the ball joint movement in the groin area a little at a time. You will know when you hit the spot, it’s a little bit eww! Move your leg in small movements up and down and feel how the hip joint closes and opens! Fold forward and lean back to feel how the hip angle closes and opens! The meaning of the phrase ‘open your hips’ eluded me for years. I just couldn’t get my head round what was meant by it. Now when I hear that phrase I think about how the ball and socket joint in my hips works. When you hear this, you should sit tall and straight (think of someone pulling you up by your ears) and allow everything else to fall into place. Put a little more distance between your chest and your thigh. Make the upper body more upright or stretching the leg down and back. Open the ANGLE of your hips! If this is not easy for you, you could have tight hips as a result of a tight Psoas muscle the main muscle group that flex the thigh. Take a look at my articles on this subject to help you. My instructor always referred to this as rolling my hips forward. In reading your article it now makes sense, the mechanics behind it. I can see where “open your hips” would be confusing to someone starting out.